So far I have collected a fair number of 1/72 scale model kits of sea-going vessels. In 2016, I finally finished building one. I expect the progress on this page will be slow, but someday I hope to display on this site 1/72 scale models of a World War Two British Flower Class Corvette, a WWII German U-boot, and a WWII USN Gato Class submarine. Other possible subjects include a German Schnellboot, a British Vosper MTB and a USN PT Boat. 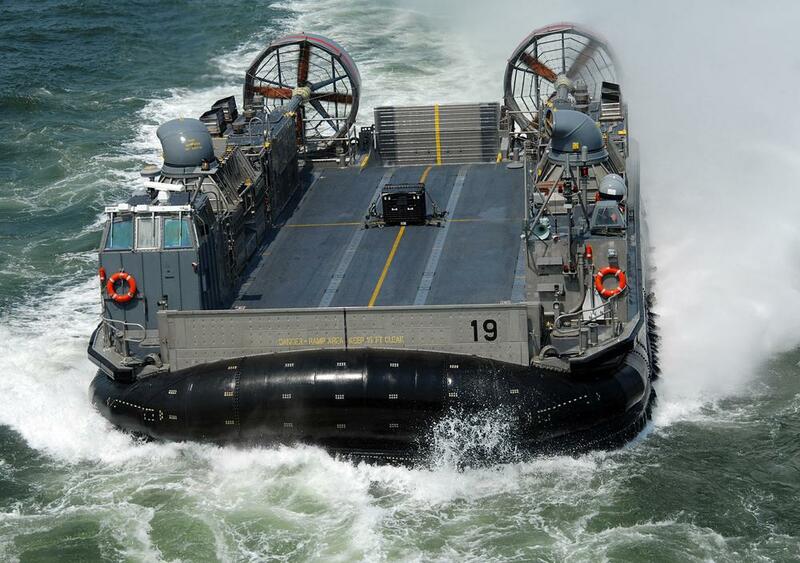 The U.S. Navy operates 91 LCAC (LandingCraftAirCushion) amphibious cargo carriers. The LCAC was developed starting in 1970 with three, different-sized proposed vehicles, designed by James L. Schuler and his team at the USN Naval Sea Systems Command. Following extensive testing of the middle-sized design (named "Jeff" after one of Schuler's three sons), in 1982 the U. S. Navy ordered the first six LCAC vehicles. By 1993, the run of USN LCACs was completed, plus eight units built for the Japanese Naval Self-Defense Force, delivered in 2004. 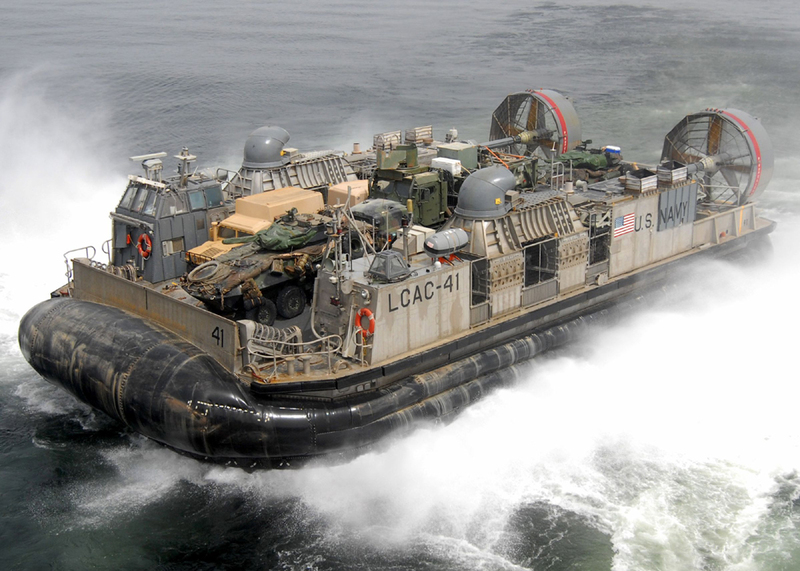 The LCAC uses four MTU Vericor TF-40B gas turbine engines (3,995 shaft horse power each) to power four lift fans that inflate the rubber air cushion and blow lift air out from under the rubber skirt. Twenty percent of the air thrust is diverted to the bow thrusters (the dark grey, elbow-shaped nozzles on top, just ahead of midships) to enable the crew to counteract crabbing of the LCAC due to wind and wave. A Service Life Extension Program will upgrade the engines to ETF-40B turbines at 4,745 s.h.p. per engine. The engines also power the four-bladed propellers that provide forward thrust, achieving up to 50 knots of speed in calm ocean conditions, even at a full normal load of 169 tons (67 tons of payload). The LCAC can operate over water, swamp, ice, or land, making nearly 80% of the world's shorelines accessible. Years ago, I saw a scratchbuilt 1/35 scale model of an LCAC at an IPMS national contest; it was huge and magnificent. I thought "I'd love to build a kit of that, but no one will ever manufacture such an unusual subject." How glad I am that I was mistaken: In about 2012, I bought this Trumpeter 1/72 scale kit of the U.S. Navy LCAC as soon as I spotted it in a now-closed hobby shop (Chesterfield Hobbies) in Richmond, Virginia. I started work on it almost immediately, but a search of the web for reference books revealed there was only one, very lightweight kid's book about the LCAC available. 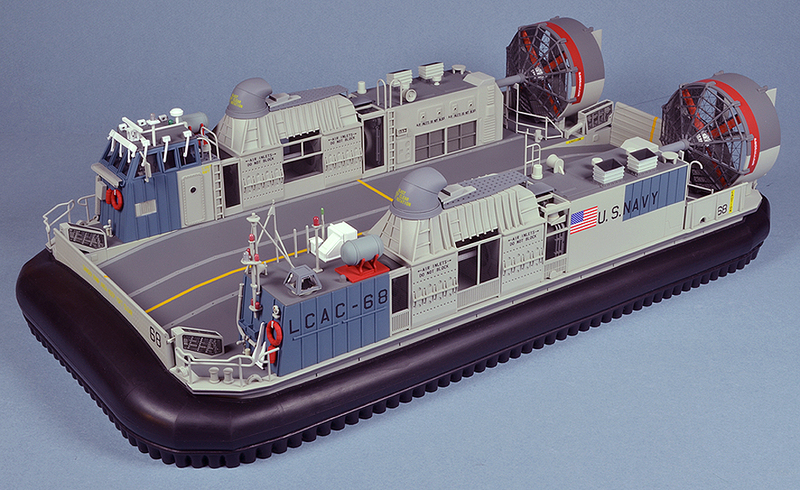 I searched the web again for pictures of the LCAC, and found many full-view shots, but very few closeup images that would help me add texture to this rather bland, under-detailed, unfinished-looking kit. My internet research did provide enough information to allow me to draft in AutoCAD the black and white line art I needed to order some custom photo-etched brass for the screens at the giant, hoop-like shrouds around the propellers. While I was drafting and ordering this custom photo-etch brass, I decided replace all of the the kit's unduly coarse photo-etch screening with new PE, as well. 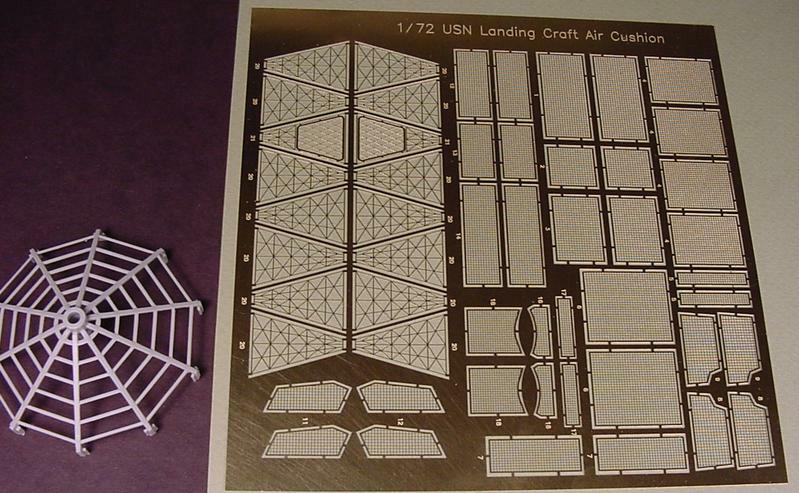 The framework part of the propeller shroud from the kit next to the custom made photo-etch screens for the Trumpeter 1/72 USN LCAC. To amortize the expense of the custom photo-etch, I ordered a dozen or so sets of the brass PE, selling the extras on eBay. But the lack of really useful, comprehensive detail images of the LCAC ultimately caused me to set the kit aside on the Shelf of Forgotten Models. I was unwilling to finish it without better information to add detail to the model. Finally, in 2016, Squadron Signal released an "In Action" booklet on the LCAC. I promptly ordered the book and dusted off the kit in anticipation. The "In Action" book was very helpful (a Squadron Signal LCAC "Walk Around" booklet would have been even more helpful) and I quickly spotted images in the booklet that helped me finish out some of the bare areas on the kit. Studying the pictures in the booklet made me aware of the relatively wide variety of subtly different versions of the real LCACs that were in service. From these photos I selected one particular vessel, LCAC-69, that most closely resembled what the kit gave me to work with, and postulated a very similar sister-craft, LCAC-68. This was the largest, most multi-colored model I have built in a long time. Planning out the paint colors to use and the sequence of masking from color to color was challenging and fun. Attaching the one-piece, flexible vinyl skirt to the hull was particularly challenging. I never could get it perfectly straight and level in some spots. All paint was Humbrol except for Tamiya acrylic at the white parts; small decals were from the kit; large alpha-numerics were Press-Type from Woodland Scenics; flat finish was Testor's Clear Flat Lacquer. That must have been something REALLY important to deliver, on the deck of this LCAC. 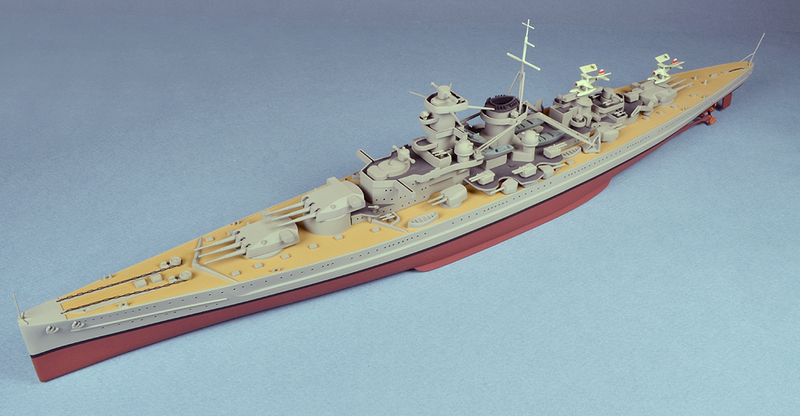 The earliest models that I assembled where I really cared about trying to build a kit as authentically detailed as I could were several Airfix 1/600 scale warship models. 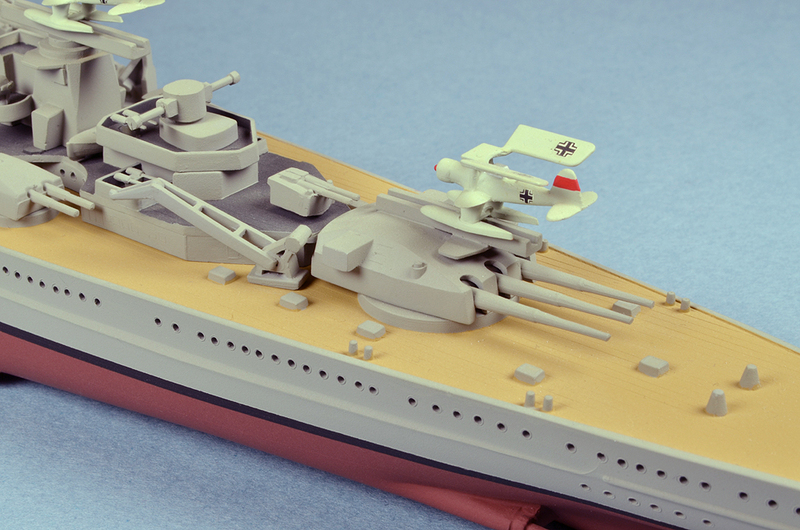 And the first Airfix ship models I built were of World War II British and German warships. My interest in these subjects was triggered by my purchase in about 1971 of a paperback from the Ballantine Books "History of the Violent Century" series entitled Hitler's High Seas Fleet. While I had zero admiration for Nazi politics and the World War they caused, for some reason I did find the warship designs of the Deutsches Kriegsmarine elegant. 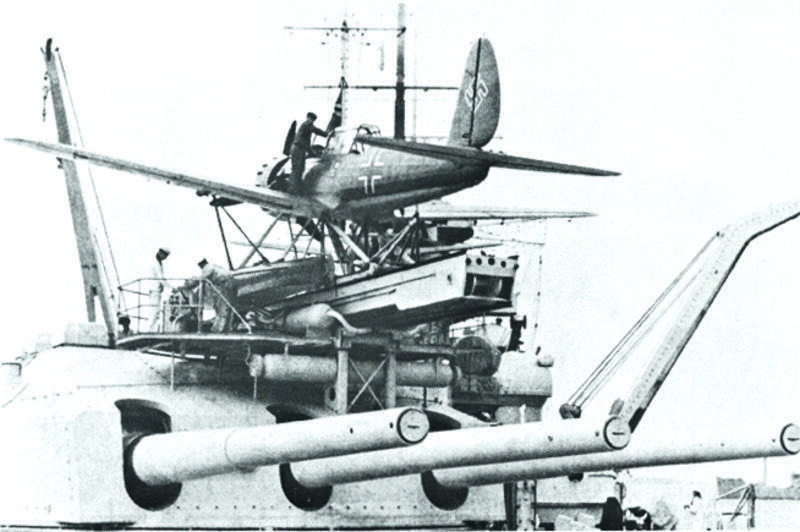 Hitler's High Seas Fleet related the short, exciting life of the German Navy in World War II, and it was illustrated with line drawings of many of the warships German naval architects developed in the 1920s and 1930s. As I learned the histories of these ships, in 1972 I started buying and building Airfix and Aurora kits of German and British vessels. One really nice feature of Airfix kits was that they usually included a couple of tiny, 1/600 scale seaplanes to mount on catapults on the warships. I loved this extra attention to detail, and I would carefully paint and decal these 3/4" wingspan seaplanes. Above is an image of DKM Gneisenau (ca 1939) that I very mildly converted from a Revell 1/570 scale DKM Scharnhorst (ca 1944), with two Airfix 1/600 scale Heinkel He 114 seaplanes mounted on the catapults. I believe I built this model in 1978 or so, not too long before the advent of photo-etched details for plastic model ship kits. Below is a detail of the He 114 on the 280mm Cesar turret. I was so proud of these ship models, forty years ago. Eventually, I started building 1/72 scale versions of these ship-based WWII seaplanes: a (Lindberg) Vought OS2U Kingfisher, a (Matchbox) Supermarine Walrus, a (Heller) Arado Ar-196, an (Airmodel) vacu-form Heinkel He 114, a (Hasegawa) Curtis SOC Seagull, and a (FROG) Fairey Swordfish with floats. As I shifted away from 1/600 warships (in the late 1970s) to pursue exclusively 1/72 scale airplanes, tanks, missiles and so forth, I wished I could build 1/72 catapults for my seaplanes, but at that time no such kits of catapults existed. In the 1990s, Hasegawa produced a plastic model of a Japanese catapult for several of their Imperial Japanese Navy seaplane kits, and I built and painted the catapult, but wasn't interested enough in Japanese seaplanes to build one to mount on the catapult, so it has languished on the Shelf of Forgotten Models for the last 15 years or so. Finally, in 2018, I was able to purchase a new Modelcollect 1/72 scale kit of a 280mm calibre triple gun turret of the Kriegsmarine battlecruiser DKM Gneisenau. 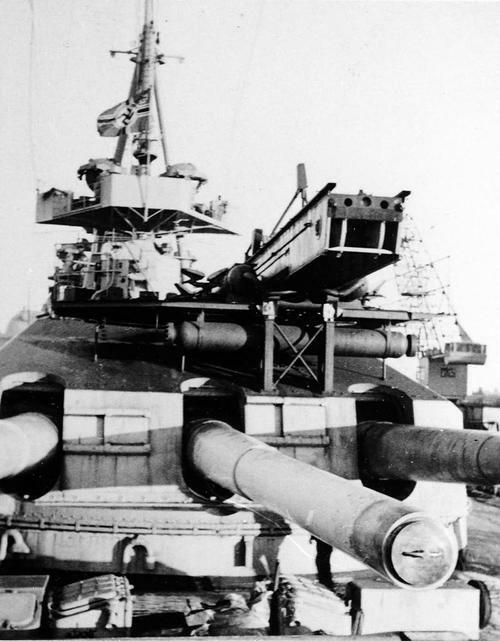 The kit was intended to model the historically factual re-use of the turret as a coastal battery in Norway in 1944 (see the image above of the Big Green Gun), but I believed I could build the turret back-dated to its appearance on the deck of the battlecruiser DKM Scharnhorst in 1940. I thought I could scratch-build a catapult mounted on the roof of the turret, and then build a Sword 1/72 kit of an Arado Ar 196 and mount it on the catapult. In the images above, the dark grey plastic is the Modelcollect kit of the 280mm turret, and the white or brass portions are the scratch-built parts. As per the coastal gun installation, the Modelcollect turret lacked the ear-like housings of the original range-finders of the turret, when it was mounted on the DKM Gneisenau, so I had to build them: you can see an image (blue background) above of the extrusions I built out of Evergreen styrene plastic, to achieve the desired cross section for the range-finder housings, as well as for the deck details. All paint was Testors Model Master with Testors Clear Flat Lacquer. I have found that the Testors Model Master paint is exceptionally great for airbrushing. I lightened all of the Luftwaffe colors on the Arado with flat white for scale effect. On the turret, to make airbrushing the yellow easier, I masked the grey painted areas and airbrushed bright aluminum as an undercoat for the yellow.